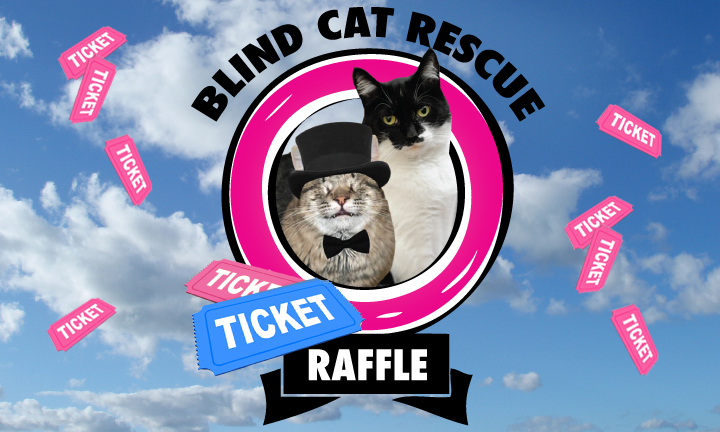 GLOGIRLY: Blind Cat Rescue RAFFLE! Hi everyone, Katie & Snicker here. While Waffles and I were on our way to our latest blog design emergency, we encountered a road detour. Sometimes those unexpected turns can take us down a MUCH more fun road. Kind of like finding a $10 bill in your pocket. ...or a catnip fish under the refrigerator. We stumbled onto an exciting event you won't want to miss! Our friends at Blind Cat Rescue & Sanctuary are having a RAFFLE! Sincker, Blind Cat Rescue's Spokescat is also here with us to share the exciting news. 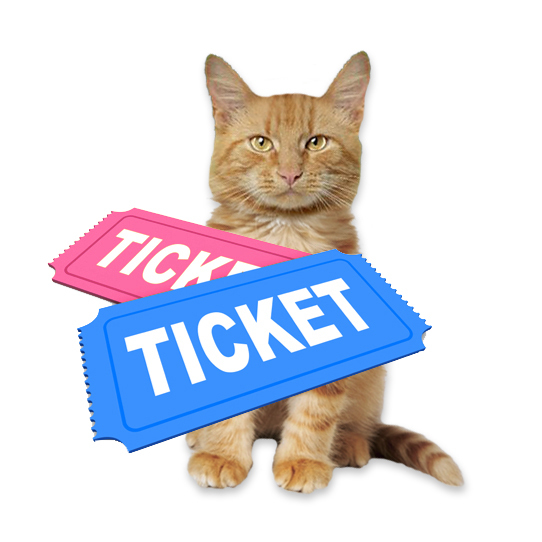 SNICKER: That's right, for only $10 a ticket you can help the me and the blind kitties. AND you can win a chance at some fabulous prizes! How fabulous, you ask? Ok Waffles, take it away! WAFFLES: Um, hi everyone. Waffles here. The prizes in the Blind Cat Rescue Raffle are super PAWSOME! Just look at some of the cool stuff you can win! Tickets are only $10 green papers each and all you have to do is CLICK HERE to buy a ticket. You can read all about the prizes there too. They even ship internationally! And, um...see all those books? Well they're not only great cat books, but they're AUTOGRAPHED TOO! No, not by me, silly...but by Gwen Cooper, Jackson Galaxy and more! The Boss has one of those PetFusion.com loungers on the bottom and she loves it! ...won't let me near it. KATIE: Waffles! Don't forget the Signature GLOGIRLY.com Tote. WAFFLES: Um, yeah that's right. The boss won't let me touch her tote either. I SO want to though...it's all pink and cute and just the right size. We checked out the prizes and they are really pawsome! And guess what? They ship internationally too...well, except for that Go Cat Climber. we will go check those out. Mommy went back and added her bloggie addy on MY blog! The nerve! Such a great way to help those sweeties! That is a really good idea. We will have to see if we can come up with the green papers. We sure want to. We love that shelter. Take care. This is a great idea. I could donate the prize if I won. We only have dogs here. We like everything we see :) ... including the ever so popular Waffles! Not to insult Glogirly and her tote but the only thing I have my eyes on is that cat tree! OH yeah! 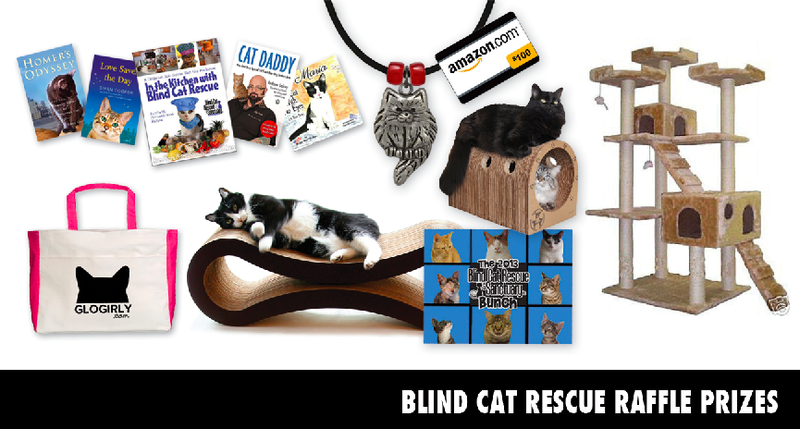 We think Blind Cat Rescue is awesome! What a great raffle, and for a wonderful rescue! We will go and check it out, for sure! Did someone miaow about a raffle ??!! What a great raffle!! Hope they raise tons of $$$ for the kitties! We are going to go over and enter the raffle. We think The Blind Cat Rescue is so cool, and does a great job. We voted for them over at the Animal Rescue Site too. Psst . . the cat is out of the bag at our place. Okaze, we buyed two tickets and we fink it's bowt time we won something round here, O Graet Cat Ruler of the World (or so you *think* anyway--Punapippuri and I have a little sumfing to say about THAT)! Wow, there's some cool stuff there!! We'll have to get the mom to loosen the ol' purse strings and buy some tickets! Oh dear Bast we love all the prizes! Definitely purchasing a ticket or two. Oh and we're also giving away a great prize too at Riverfront Cats--a Tiffany necklace! Hurry before contest ends Oct 12.